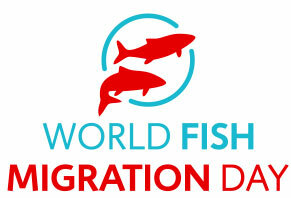 May 24, 2014 is World Fish Migration Day. There will be events all over the world and The Nature Conservancy has teamed up with the State of Connecticut Department of Energy and Environmental Protection, Princeton Hydro and other partners to sponsor events throughout Connecticut. The Branford Land Trust is a World Fish Migration Day partner. Watch here for more information on the Branford Supply Pond Fishway Open House to be held from 10 a.m. – 3 p.m. on May 24. Branford, Branford Water Supply Ponds Dam Fishway, 10 a.m. to 3 p.m.
Bridgeport, Bunnells Pond and Pequonnock River Apron Fishways, 10 a.m. to 3 p.m.
East Berlin, Stanchem Dam Fishway, 10 a.m. to 3 p.m.
East Haddam, Leesville Dam Fishway, 10 a.m. to 3 p.m.
East Haven, East Haven Diversion Dam Fishway, 10 a.m. to 3 p.m.
Greenwich, Mianus Pond Dam Fishway, 9 a.m. to 1 p.m.
Old Lyme, Mary Steube Fishway, noon to 3 p.m.
Old Lyme, Rogers Lake Fishway, 12:45 p.m. to 3 p.m.
Preston, Hallville Pond Dam Fishway, 12:30 p.m. to 3:30 p.m.
Wallingford, Harry O. Haakonsen Fishway at Wallace Dam, 10 a.m. to 3 p.m.
Windsor, Rainbow Dam Fishway, 10 a.m. to 4 p.m.
Start the day with Steve Gephard, a fish biologist with the CTDEEP, and Sally Harold, Director of Migratory Fish Projects with The Nature Conservancy, and listen to their talks on migratory fish. Steve’s talk will focus on the biology of the various species of migratory fish found in Connecticut, their status, and describe some of the threats facing them. Sally will review the various dam removal and fishway construction projects undertaken in Connecticut by a variety of partners working to restore runs to Connecticut waters. After the talk, attendees may visit one or more of the participating fishways listed above, a guided tour with DEEP’s Steve Gephardt and The Nature Conservancy’s Sally Harold. Tour includes: Mary Steube and Rogers Lake fishways in Old Lyme, Latimer Brook fishway in East Lyme, Greeneville fishlift in Norwich, and the Hallville fishway in Preston. We’ll return to Old Lyme. For descriptions of these fishways. These sites have limited parking so participation will be capped at 25 cars (no limit on the number of people). To participate, you must register by clicking here. • Click here for more on these events.